L: Francis – let’s start at the very beginning. Where were you born, and where did you live as a child? Did you have an easy childhood? F: I was born in a “dormitory town” called Reading, not famous for much, apart from a huge Rock festival, and for the fact that Oscar Wilde was sent to prison there and wrote ‘The Ballad of Reading Gaol’. My family then moved to a farm in the country, in Sussex, not too far from London. I was sent, aged eight, to a boarding school, so I would spend long periods away from my family. Imagine having regular prison sentences imposed upon you as a child. At some of the schools I attended there were psychotic teachers and cruel nasty children. I used to count the days when I could be reunited with my family. I became a recluse in the art room and painting was my salvation. I had a teacher who encouraged me to paint and introduced me to various artists, including Kandinsky. I went from austere harsh boarding schools to Art College, a very different environment. L: Give me some insight into the man behind the writer, Francis. Are you generally an optimist or a pessimist? F: Like most people I am a complicated mixture of idiosyncrasies. I can be intense, but at the same time very laid back. I have a steely determination that comes from my mother. I feel maybe I am an outsider trying to fit in and yet I am very anti-establishment. I want to be respected, my work to be liked or even admired, but I don’t receive praise well and feel uncomfortable with it. Some people might say I should see a psychiatrist, but at the same time, I can be very inwardly-calm and rational. L: So when exactly did you begin writing? And how does your recent work compare with what you first wrote? F: moved to a remote village in Austria. It was not far from Vienna, but a very oppressive and strange environment. I thought I should try writing a book. I launched into it…nothing came of it. I do many creative activities, painting as well as writing music. Writing lay dormant, put to one side. Then later, living in Paris at this point in time, via an advert I made contact with a man called Alan Clark, who had a literary magazine called ‘Rat Mort’ (dead rat). I submitted four short stories for this magazine, encouraged by Alan, I began to write more and more short stories, and developed a style…I guess if I compare these stories to earlier efforts at writing…there has been a huge development…I am sure my early attempts were imaginative but raw. L: What about now – what are your current projects? F: I am currently feverishly promoting my book Flight of Destiny, which was published in April. L: What genre do you consider your stories to belong to? Have you ever thought of writing in another genre? F: I write dark surreal short stories. I have tried children stories, but even these tended to be a bit on the dark side. F: I have been told my work is a bit like that of Edgar Alan Poe. It was a pleasant surprise to be compared in such a way. L: Do you have a trademark writing style – something that makes your work recognizable? F: My stories are very descriptive and visual. I would say they are very British in character. I would like to think they are dark, but also have an element of wit…maybe a British dark sense of humour. They are often anti-establishment. There are often reversals, characters people might expect to be bad (like the gangster Gecko in Bugeyes) who come across as being wise and good, and the types people might expect to appear good (for example there are a few preachers in my stories) who come across as the opposite, bad and inhumane. I would like to think I use rich language with sharp powerful sentences. The starts to my stories are also critical, for example my story Bugeyes begins with: Bugeyes was due a life of toil. Seed begins with: Captain Spender’s wife was ovulating. Cast from Hell begins with: There it was: I was to be banished from hell. It is important I start my stories powerfully, but also end them strongly. L: Do you only write short stories? F: I am a fully committed short story writer. One day I would like a novel published, but at the moment I just love the format of short stories. L: What inspired you to put this collection together as your first book? F: My book grew from building up a body of short stories, similar to my contributions in Rat Mort (the small literary magazine I mentioned). I also had short stories in a magazine called ‘Freakwave’ as well having short stories published on the internet. I was lucky enough to find a publisher who was prepared to put a whole lot of them together. L: How do you come up with your titles? F: A lot of my stories revolve around, fate, misfortune. 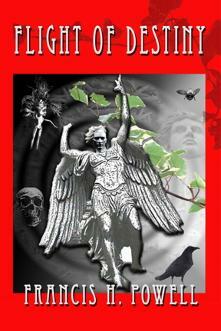 ‘Flight of Destiny’ seemed to encompass a strong notion of this running through the book. L: Are there any messages in your stories, and if so what are they? F: There are quite a few. Principally: fight back; don’t let those who oppress you succeed. Fight off those chains and shackles. L: How much are your stories based on reality, and how much are they based on someone you know, or events in your own life? F: To some extent my stories are indirectly autobiographical. My life has not been a smooth journey, with many setbacks along the way. I don’t think I consciously draw a line between real events and the fiction I write. I doubtlessly draw from my experiences, good or bad. L: What books have influenced your life the most? Are some of these different from your own genre of writing? F: I am not sure books have directly influenced my life – it’s more the people and events surrounding my life. L: Is there a character in one of your stories that really stands out for you? Could he or she be compared to any well-known literature character? F: I guess ‘Bugeyes’ for me stands out. He is born into an aristocratic family, with a genetic fault (over-large enormous eyes) and is immediately rejected by his mother and sent to live with a servant on the estate. He is mocked cruelly due to his physical defect, as well as being denied his natural inheritance. He gets revenge in the end. L: Do you have a favorite author and what is it about them that you admire? 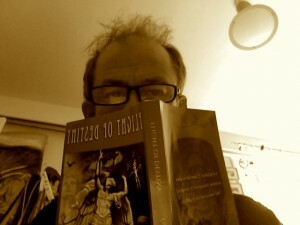 F: Rupert Thompson, author of ‘Dreams of Leaving’ and many other fine books. L: Are you ever shocked by some of your own writing/ideas? F: There are some pretty crazy things that go on in my stories. They are surreal and dark and excruciating at times. I wouldn’t say ‘shocked’ but maybe retrospectively sometime in the future I might think did I really write that? L: Do you see writing as a career? F: It would be nice…it’s not my career at the moment…I am happy with what I have achieved in many different fields. L: Were your parents avid readers? Have your family played a part in your writing career to date? How do they feel about your work? F: My father had a strong work ethic, but when he relaxed he read Shakespeare and listened to Beethoven or Mozart at the same time. My mother certainly is and was an avid reader. My father is dead, but I imagine he would abhor a lot of my stories, as they show religious types in a very negative light, as well as other member of establishment. My mother has read some of my short stories and seemed to like my style. L: What makes you feel proud of yourself as a writer? F: Looking at my book, and thinking, I wrote that. I did a reading recently and people seemed to really respond to the story I was reading, that was a nice feeling. L: How do you come up with the initial concept of a book? F: Ideas seem to plant themselves in my head and I feel a need to expand on them and develop them. Sometimes newspapers provide excellent sources. I read obscure stories about people stealing other people’s identities, for instance a person who pretends he is a Duke, but in reality he is a fraud. L: Who designed that amazing cover for your book – how did you choose it? L: What is the hardest part of being a writer? L: Do you have any advice for other writers? F: Stick at it, don’t fall along the wayside. L: Other than writing do you have any other interests and do they connect up with your writing? L: Are there any films that have influenced your writing? What kind do you like? F: I love films…and I am sure a lot have indirectly influenced my writing…A couple of my favorite films would be ‘One flew over the cuckoo’s nest’ and ‘Amadeus’. I like films that are historical, psychological, unusual, films that make me think, films that educate me. Films that are witty. L: If your stories were adapted into films, which director dead or alive would you want to direct them? Which actors would you like in them? What would be the overriding mood of the film? L: Do you socialize with other writers or creative people? Do you know any obscure or up and coming authors/or perhaps other creative people who deserve recognition? F: I am going to start to mix with other writers in Paris. I have been lucky enough to meet a range of talented people during my lifetime. I know many people who deserve recognition for what they do…an artist called Andrew Tyler for example. L: Thank you, Francis. Just one more question, and I think I can guess the answer, but I’ll ask you anyway… Is there a particular theme you realize is most prevalent in your stories? F: There are many different themes: injustice, inequality, sibling rivalry, death, torture, it’s all in there.